That would kinda preclude another though wouldn't it? After all, one vessel hardly makes a fleet.. If true, the next would have to be "LPV Too". This new picture from reddit shows that they are modifying the chimneys right now. I think they are in the process of getting rid of them. I put a picture of before the started working on it (new one on the left). The @blueorigin recovery ship as seen today at birth. Berth*. Excuse my lack of proofreading lol. Looks kinda weird without the exhaust stacks. I wonder what they have in mind? Side or rear perhaps?? EDIT: She's looking a little tired and rusty too.. they sure have an awful lot of work to do. EDIT: She's looking a little tired and rusty.. they sure have an awful lot of work to do. A bit of surface rust, the hull seems in good shape. I think rear exaust would be the best. 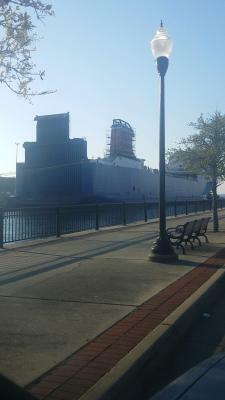 Seem to recall that Blue Origin will rework the stern of the boat to look like a VLCC with the exhaust uptakes re-routed to new small deckhouse on the stern. If so, that's an enormous amount of work - far more than SpaceX ever had to do to build an ASDS. Including dry-dock, survey and sea trials we're talking months.. up to a year even, depending upon how many resources they throw at it. Anyways, whatever happens, it'll be fun to sit back and watch. Lot more work but lot better sea boat enabling landings in rougher conditions. The other big plus is quicker turnaround time, able cruise comfortably at 20knots in most sea conditions, compared to barges 5-10knots. Think this drastic ship conversion is to test out features on future Landing Platform Ships. After all why build something new when you can convert a worn out and semi-expendable ship as interim LPS trial ship. Once you know what works call up a shipyard for serial production. 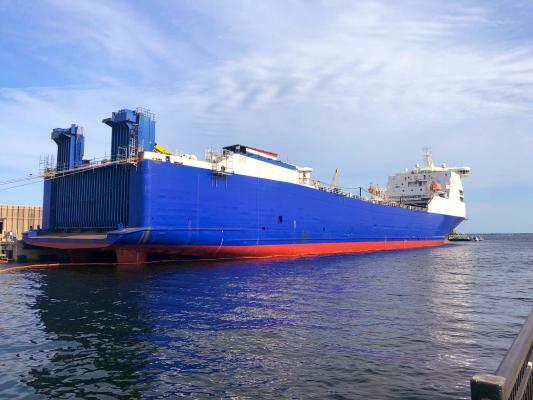 It is going to take at least 3 LPS to maintain a reasonable launch tempo of about a launch every 4 weeks due to the distant from landing point back to Port Canaveral. At 20knots it can cover 480nm every 24hr. One ship is plenty for forenitely launches. Yes, but sometimes a ship needs to go in drydock for refurbishment, so two boat would be very nice to have. Plus if they want to launch polar orbits from the west coast and on the east coast at the same time. 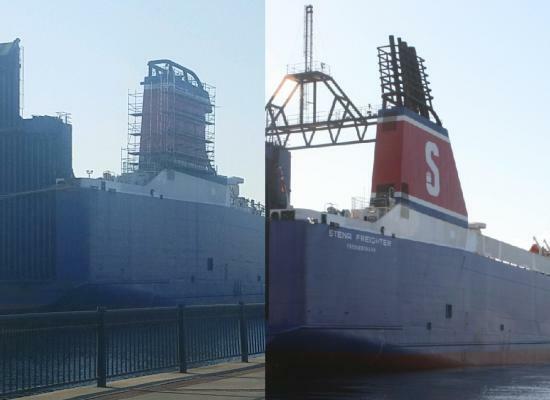 New images from the shipyard, there seems to be a lot of cranes inside the ship. The stacks are gone and covers (presumably temporary) have been put in place from what I can see. All we need now is someone willing to send a drone over the top for a quick peek..
Let's not encourage trespass. Merely going up high enough from public access might well give all the views desired. I think the higher cruising speed may be at least partially offset by the fact Blue intends to land further downrange. I also think that since Blue isn't planning RTLS for this generation it's more important to them to develop a more capable landing ship than it is for SpaceX.